I'm short THLD from the $4.25 breakdown continuation. There was a ton of support 4.60 to 4.70 area. There was a shooting star candle the day before too. So I want to short the trend resistance down to trend support. 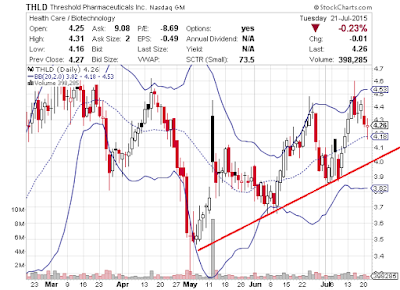 Trend support is 4.00 to 4.05ish so I will ideally cover there. I did a post on Stock Pursuit about how overbought the Nasdaq is after these tech giants runs. The Nasdaq was flat yesterday and it looks like the futures this morning are pointing to big weakness off of Apple AAPL bad news. I will short the Nasdaq with the ultra short ETF QID here this morning on any Nasdaq weakness. Should be good for a swing trade.